Virtual Contact Center provides metrics out-of-the-box generated from pre-defined queries. Additionally, you have the flexibility to generate custom metrics using the available stats. The Fields tab in the wallboard definition lists all the available real time stats with a brief description. For example, you can track number of agents waiting for interactions in a queue, number of agents processing interactions in a queue by using readily available status such as available, and processing. In the Fields tab, select desired stats from a list of available fields. Note: You can also generate custom metrics by defining custom fields. For details, refer to Customizing Metrics. 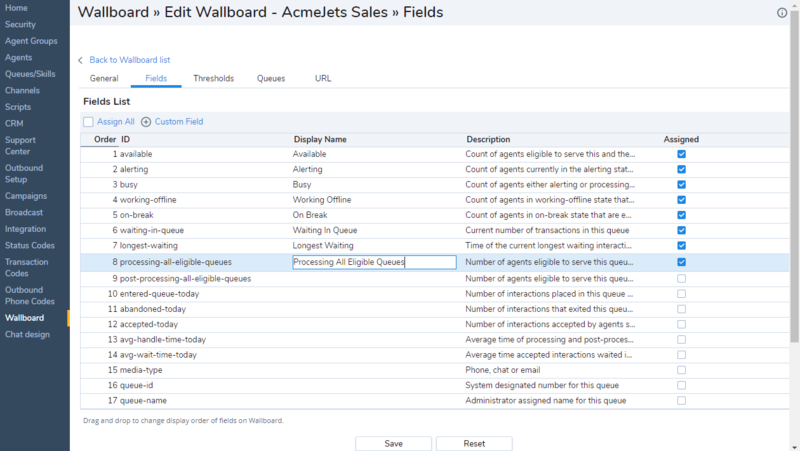 Drag and Drop the fields to change the display order of the fields on wallboard.